Livvy is on the run. And she's escaped to the one place nobody will ever find her. But the isolated cottage isn't empty. Her refuge is home to a troubled stranger, Tom, for reasons of his own. In the intimacy of the abandoned cottage, and the remote wilderness of the island, the electrifying connection between them is impossible to ignore. Both running from their histories and shielding dark secrets, their pasts catch up with them and collide in an unimaginable way. Deep emotions and powerful chemistry face a painful battle with the tangle of lies, and scars of the past. If the truth emerges, hearts will be shattered. Can love conquer? Natasha Boyd's Eversea series captured my heart and put me in a dreamless state for quite a while, so when I saw she gave life to a new story I knew I had to read it. I'm just kicking myself for not having done it sooner! There are pieces of a big puzzle you have to fit together during the read, but one seems to always be missing... When you finally find it, your reaction will probably be heard thousands of miles away. Indeed, everything is even more messed up than you could possibly believe, and this is exactly one of the things that makes me turn page after page and forget about the rest of the world. I just LOVE that! Add to this some great characters—main and minor ones—a superb sexual tension, the unique way Boyd has to describe some very HOT scenes and the emotional state she puts you in for very different reasons, and you know this is a read you really can't miss. 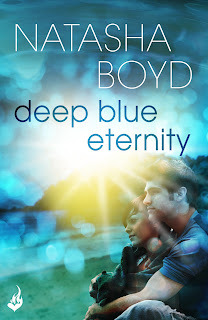 Darker than her previous works and totally engaging, "Deep Blue Eternity" is another beautiful Boyd's masterpiece, one I strongly suggest you to grab, like yesterday!